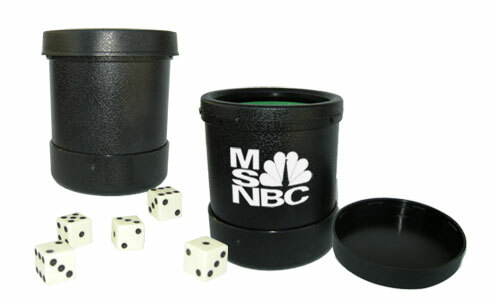 These Custom Imprinted Dice Cups with Lids are made of durable textured black plastic. Each cup features a twist-off top and a green felt lined interior. The Dice Shakers measure 3.6" in diameter by 4" high. Your can imprint these Custom Dice Shaker Cups on the Lid or on the side of the Cup. Please specify your imprint location preference when ordering the Dice Shakers. Standard Playing Dice or Custom Dice are available for an additional charge (the prices below are for the Imprinted Dice Shakers only). Currently Out of Stock! Please call for updates.